We came to O’Connor’s Seafood Restaurant in Bantry for the fish. And we were soon hooked..
We were off to a winning start with a shared plate of oysters (from their tank). 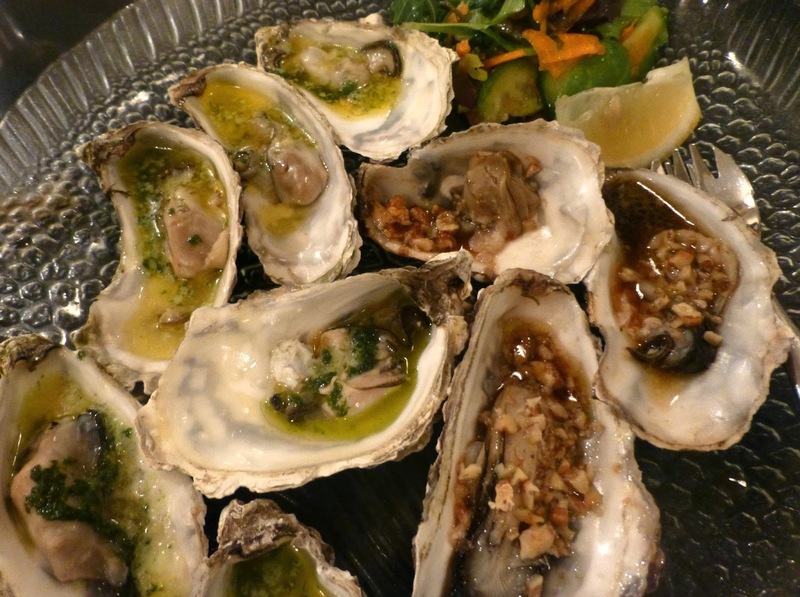 These were a mix of baked oysters, some with Dungarvan Stout and walnuts, more with garlic and herb oysters with lemon, all delicious and all quickly dispatched. Almost an argument over the last one (we got an odd number!). It was a quiet night in the restaurant. Indeed a very quiet Friday (07.03.14) in the town, very few cars parked around the square, and most of the other restaurants that we passed on the way back to the hotel were not busy. It was, of course, just after the recent storms. Hopefully the numbers will pick up now that Spring has arrived. Bantry is a lovely place to visit and there are many attractions in the general area. 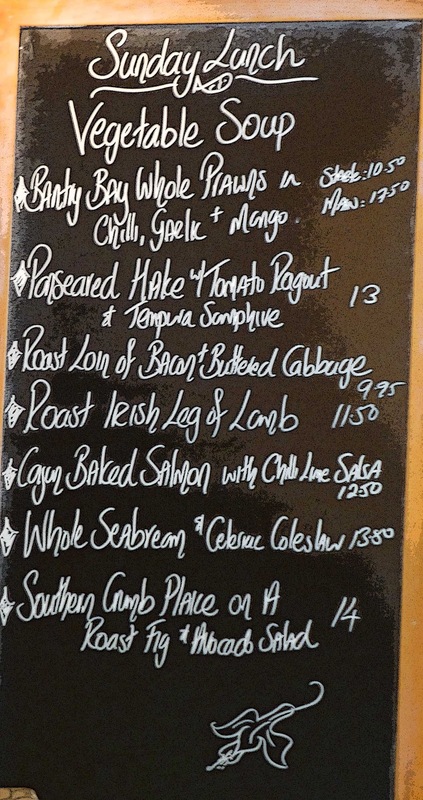 The O’Connor’s menu changes regularly, and each day the specials are decided by what comes in from the local fishermen. We were in luck. Swordfish and monkfish were on the menu and they were cooked and presented superbly while the service throughout was friendly and efficient. I picked the Swordfish. The steak was chargrilled with pan-fried smoked sun dried tomato and served with a roast pepper polenta cake and, not mentioned on the menu, a basket of house-made fries. 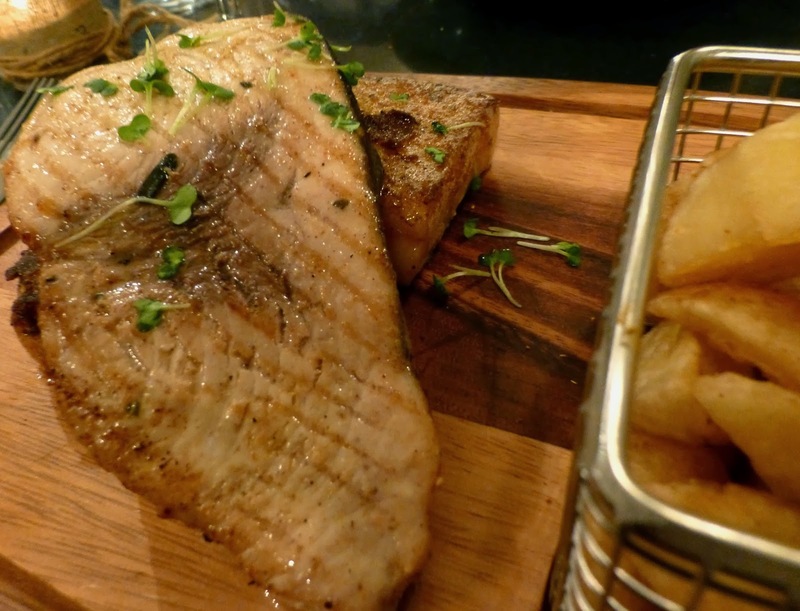 Swordfish can be a dodgy choice as some restaurants cook it for too long and it comes out dry and hard. But this was moist and tasty and the polenta and tomato cake was a gorgeous and appropriate accompaniment. The fries too vanished quickly as indeed did the shared sides of vegetables and potato. 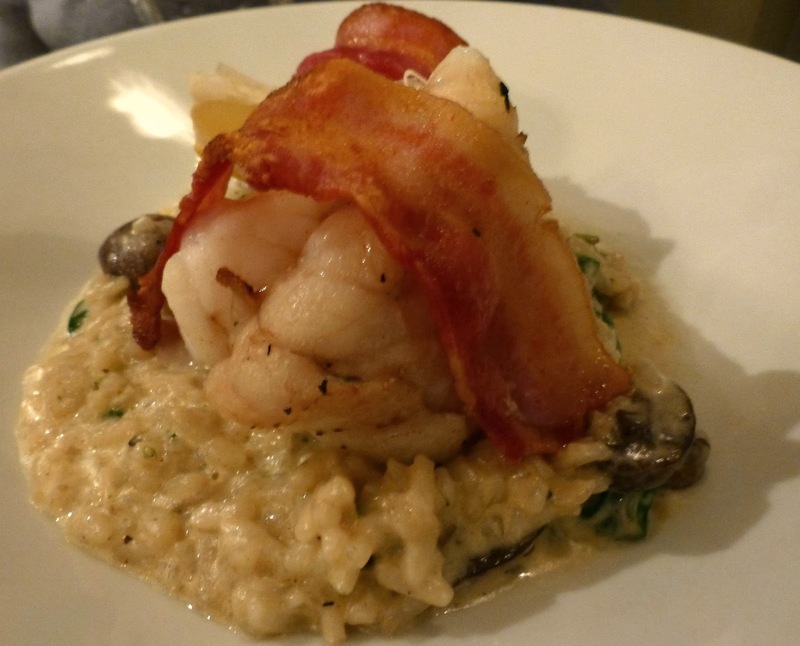 The other mains was also a delicious delight: Pan-fried fillet of monkfish wrapped in smoked bacon with a divine wild mushroom and baby-leaf spinach leaf risotto. O’Connor’s had two very happy customers on their hands at this stage, the happiness helped by a smashing organic Chardonnay by Langa (DO Calatayud), a surprisingly beautiful bottle for 24.75, intense and complex aromas, fresh and fruity with a long and pleasant finish and,by the way, an ABV of 14.25%! Took a break from the wine then while enjoying a couple of excellent desserts, a Blackberry Fool and a Mixed Berry and Champagne Sorbet. Soon, we were back on the street and strolling to the nearby hotel. 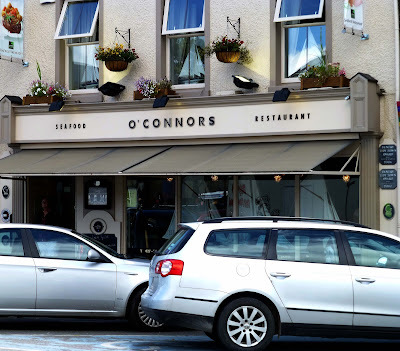 O'Connor's are a Good Food Ireland member and other members among their listed suppliers are: Jack McCarthy, Shannonvale Chicken, Toons Bridge, Dungarvan Brewing Co., Ballycotton Seafood, Ardsallagh Goat Cheese and Cashel Blue. Enjoyed a lovely friendly welcome on our first visit to O’Connor’s Seafood Restaurant in Bantry at the weekend. We had been impressed with the outside of the well kept building and with the nautical display in the window. Walls are nicely decorated with photos and the Good Food Ireland Map, proudly displayed . 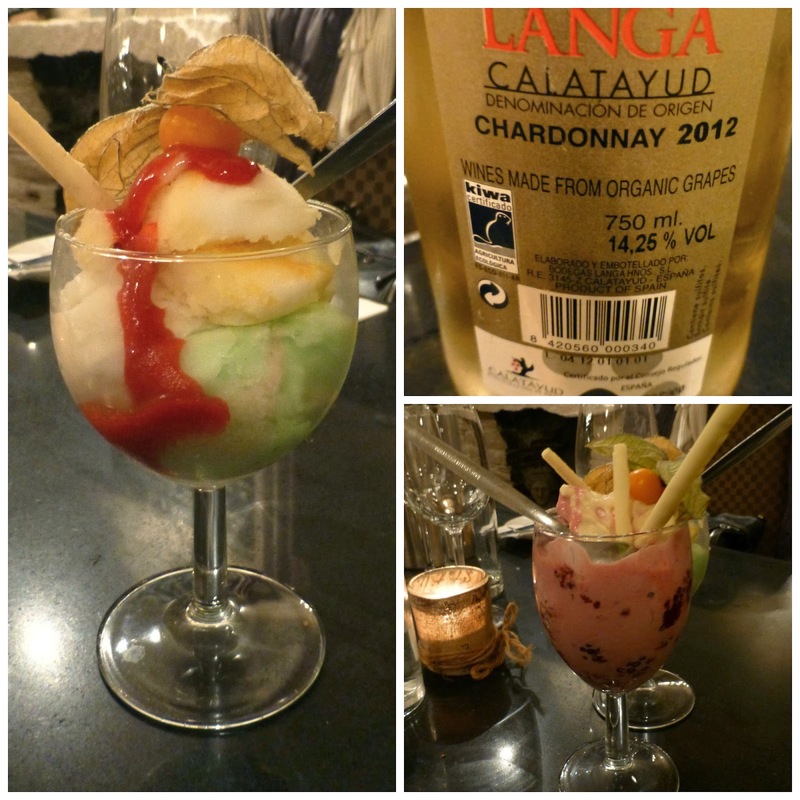 The restaurant is both comfortable and cosy and the seating is really really good, as were our first impressions. And that continued with the service. It was excellent, top class, friendly and informative, chatty, yet not in your face. And it wasn't just us. A Scottish couple nearby got a brilliant run down on what was available locally and in Cork City. Of course, the most important ingredient is the food. 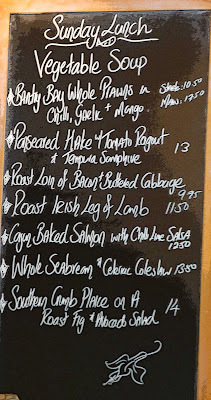 We came for the fish, of course, but the Sunday lunch menu is quite extensive and meat eaters won’t be disappointed either, as you can see on the photo of the menu. 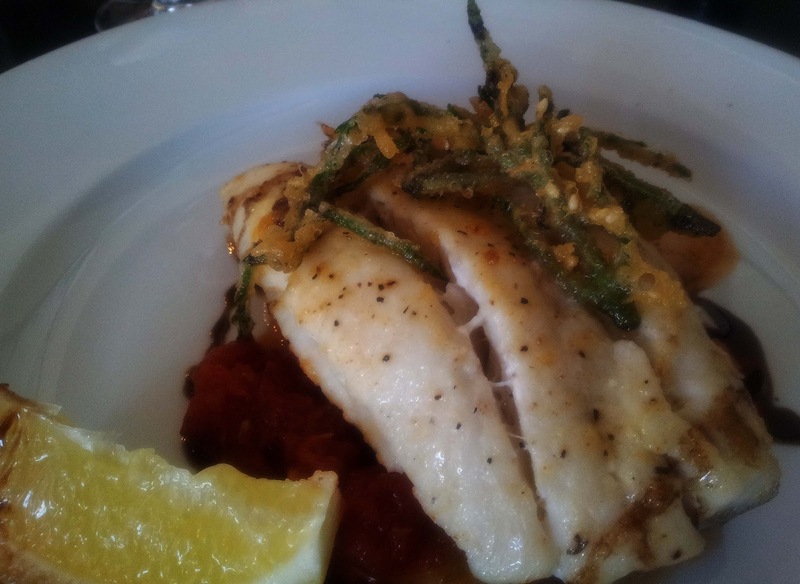 I picked the Pan Seared Hake with the tomato ragout and tempura Samphire (€13.00). Simple enough. The chef let the fresh fish do the talking here and it was excellent. 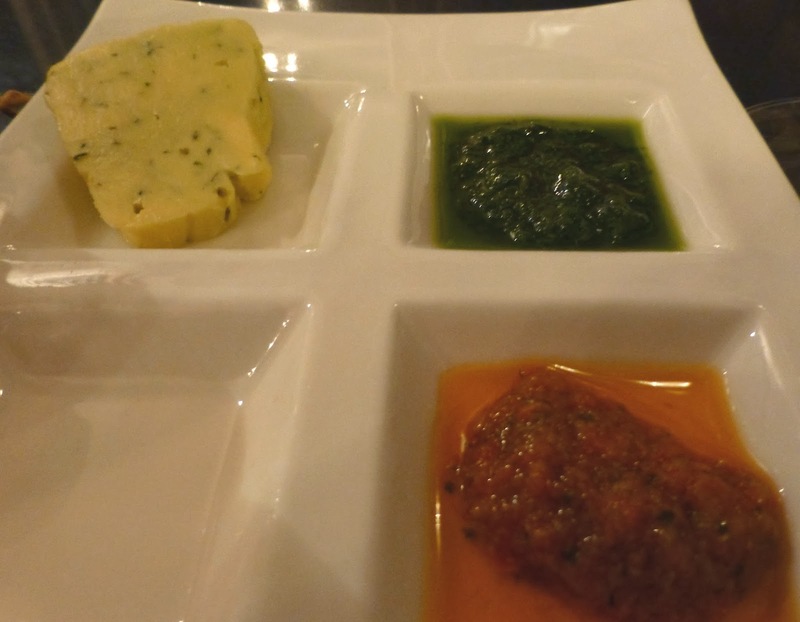 Must say also that the ragout and Samphire were absolutely delicious accompaniments. Not to mention the spot-on side dishes of vegetables and potato wedges. They had some tempting regular desserts but the day's special was my pick and it was Cherries (they are in season), Chantilly Cream, and all on a base of broken Toblerone biscuit. Very nice indeed. It is a case of quality in, quality out. Most of the suppliers are local and include Central Fish Market Bantry, Jack McCarthy Kanturk, Bantry House Walled Gardens, Bantry Bay Crab, Cashel Blue Cheese, McCarthy’s Butchers Bantry, Michael Moore fruit and veg and Oysterhaven oysters and Mussels. Pat Kiely was chef here when O’Connor’s won a national award a few years back. After a spell at the Rising Tide, he is back now as owner and has assembled much of the team from those days. The place is a credit to himself and his staff. And well worth a visit if you are in the area.